By Jake Adams The blue and yellow wrasse, Anampses lennardi, is an exceptional species of reef fish that stands out in a family of many beautiful, colorful fish. Also known as Lennard’s wrasse, A. lennardi is an Australian reef fish that was all but unknown in the aquarium hobby up until a few years ago. It is only within the last six months that the species became imported in appreciable numbers for the aquarium trade in the United States. What makes A. lennardi unique is not just its novelty to aquarium hobbyist, but an amazing coloration that changes dramatically as the fish grows. 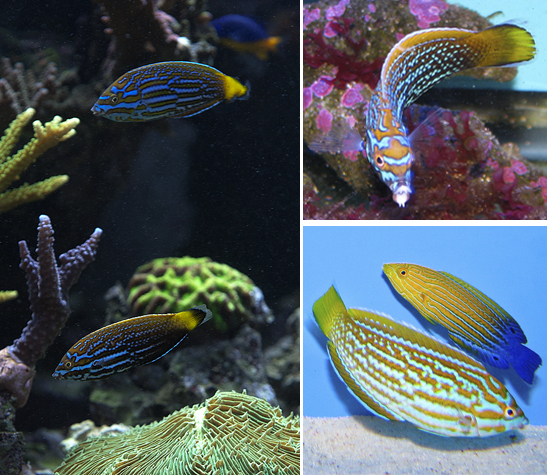 Lennard’s wrasse becomes increasingly colorful as it matures with adults becoming a stunning blue and yellow that challenges the beauty of the related and highly sought-after femininus wrasse, Anampses femininus. The Anampses genus includes many beautiful but touchy reef species with a track record of being challenging in captivity. 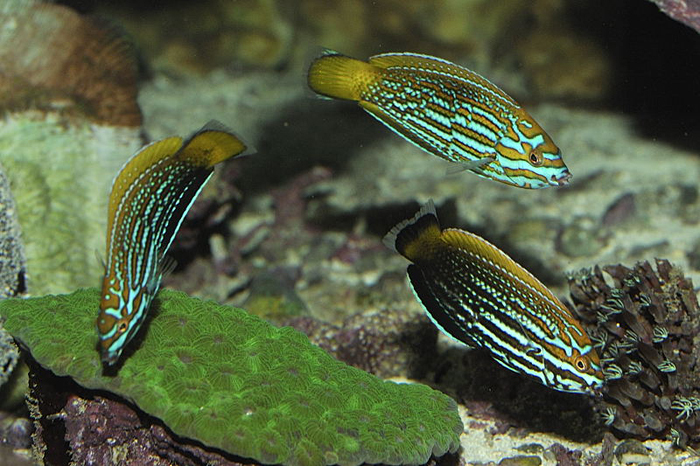 If some basic care requirements are met, Lennard’s wrasse is actually one of the more suitable species of Anampses wrasses for the captive aquarium. The blue and yellow wrasse is an Australian endemic reef fish that is only found on the northwest coast of the island continent. More specifically, A. lennardi ranges from Exmouth to Point Samson in Western Australia, but it is most often documented from the Dampier Archipelago. Although the marine aquarium hobby has had access to iconic Australian reef fish like Harlequin tusks, personifer and scribbled angelfish and the sensational Cirrhiblabrus lineatus for many years, these species are collected from eastern Australia and the nearby Coral Sea, thousands of miles away from where the blue and yellow wrasse is naturally found. Before Australia began to export stony corals, it was not commercially viable for a fish collector to travel to the other side of the continent to collect any fish there for the aquarium trade. It is only with the opening of coral exports from Australia that marine life collectors found themselves in Western Australia, collecting awesome Acanthastrea lordhowensis, Scolymia australis, Symphyllia wilsoni and other amazing chalices and faviids which are abundant on Aussie reefs. Once coral exporters began collecting on the Indian Ocean side of Australia, it then was at least conceivable for them to export some fish along with the Aussie corals that are still in high demand. However, dealing in stony corals is not the same as dealing in live reef fish; corals need simply to be found to be collected, but once you know where to find reef fish you still have to catch them. Also, reef fish are more demanding in terms of needing clean, well- oxygenated water and they suffer more losses in transit and shipping than live coral colonies. The harvesting situation is even trickier with the blue and yellow Anampses wrasse. A. lennardi is most common around the Dampier Archipelago of Northwest Australia, but most of these islands and reefs are protected marine and nature reserves which are off-limits to harvesting of most kinds. To collect Lennard’s wrasse in any decent numbers, marine life collectors have to boat out to outer islands far from the Dampier Archipelago where harvesting is permitted, which adds to the difficulty and cost of making this species available. Although Lennard’s wrasse is a shallow water reef fish around the cooler waters of the Dampier Archipelago, where it is actually collected at the fringes of it’s known range, Lennard’s wrasse occurs in deeper water and in lower densities. Needless to say, getting Lennard’s wrasses to an aquarium store in the U.S. or Europe is quite a task. 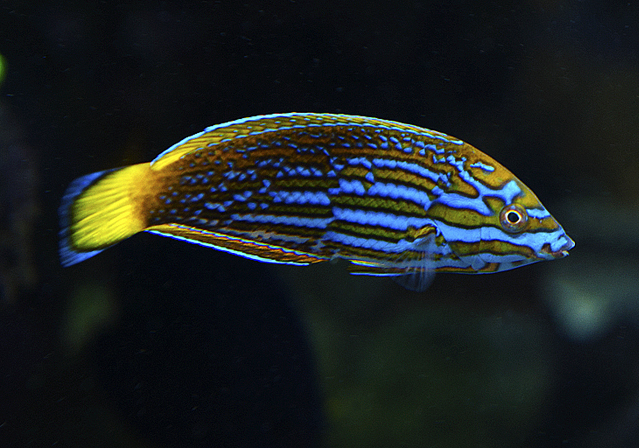 Considering the limited range of the blue and yellow wrasse, the distance it must travel in shipping and the red tape and other obstacles to obtaining and exporting this species, it is a minor miracle that Anampses lennardi is available to rare fish fanciers in any decent quantity at all. Despite all the difficulties associated with obtaining the blue and yellow wrasse for aquariums, the amazing coloration is well worth the effort for a fish whose appearance can be described as jaw-dropping and spectacular. top photo by Jake Adams; bottom photo by Sanjay Joshi. Anampses lennardi begins life as a muted minnow with a color and pattern generally approximating that of the juvenile pattern of other Anampses species. Juvenile A. lennardi are black with a yellow dorsal fin and fine white spots on the face and thin white stripes on the flank of the body. In between a length of two and three inches (5-7cm), the yellow dorsal coloration begins to suffuse the dark body coloration, and the thin white stripes widen and become bluer with increasing size. An adolescent Lennard’s wrasse is a golden brown base body coloration with four to five thick blue horizontal stripes running down the length of the body. The blue stripes are very bright on the face, a little bit irregular down the middle of the body, and they break up into blue spots on the anterior part of the body. The unpaired fins are yellow with the dorsal and **** fins being framed by one or two bright blue lines but the caudal fin is mostly solid yellow. Part of what makes the colors of Anampses lennardi truly stand out is a thin margin of dark brown color between the blue and yellow pattern of the body which increases the contrast between these two colors. If Lennard’s wrasse stayed this coloration it would already be a standout fish, but the intensity of the coloration only increases with age as the blue becomes more turquoise and vivid, and the golden brown base coloration is completely replaced with bright yellow. The culmination of the blue and yellow wrasse’s color change is a lemon yellow fish covered with a dot and dash pattern of turquoise blue that produces an absolutely show-stopping marine fish. It has only been a very short while since Anampses lennardi became more available in the aquarium trade. The majority of the captive specimens so far have been juvenile and adolescent in coloration, with only a few individuals showing anything close to the solid yellow and blue adult color. All imported specimens thus far have been between two and four inches, with just a handful in the six to seven inch category, yet this is a far cry from the twelve inch maximum size recorded for this species, at which point the coloration is so bright as to almost appear artificial. 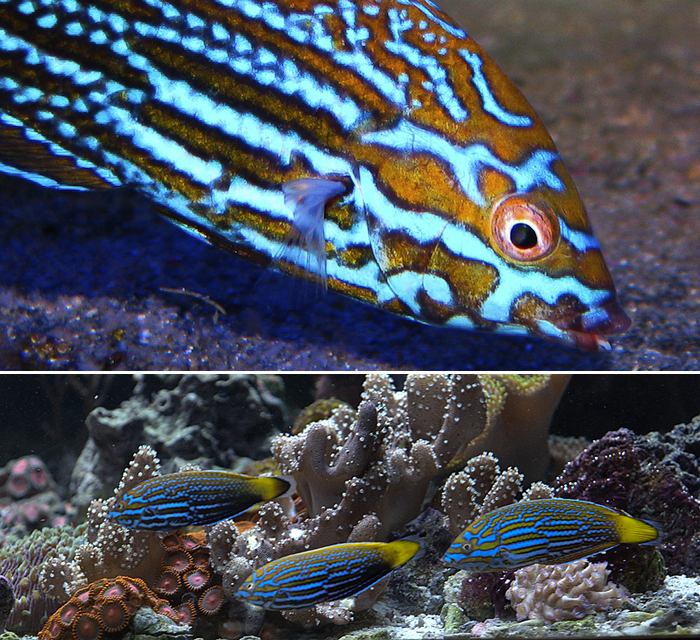 Although the scant information available on this species states that A. lennardi doesn’t change appearance much with size, the transformation from a yellow topped black juvenile to a solid blue and yellow striped adult is quite a dramatic one. Furthermore, terminal phase male Lennard’s wrasse are reported to have thick blue streaks on the caudal fin, yet this image from the Randall Fish Photos website shows a male specimen with quite a different coloration than simple blue streaks in the tail fin. left photo by Sanjay Joshi; right photos by Jake Adams. Lennard’s wrasse is not just a unique looking reef fish, it also hails from a part of the world with a unique climate and ecology. The Dampier Archipelago is an intensely studied part of Northwest Australia because the region consists of a variety of habitats, and it is extremely bio-diverse with 736 fish species documented from the region. The wide range of habitats partially explains the high biodiversity found around the islands of the Dampier Archipelago, but more importantly, this eco-region is at the confluence of the warm southern-flowing Leeuwin Current and the cooler, northern-flowing Ningaloo Current. These opposing oceanic currents not only bring in the pelagic larvae of reef fish from tropical reefs of the north and subtropical reefs of the south, but they also play a role in producing a wide temperature range in the Dampier Archipelago. The sea surface temperature of Dampier gets as hot as some other reefs to the North and South of it, but for much of the year the Dampier Archipelago experiences temperatures as much as three to five degrees Fahrenheit cooler than neighboring reefs. The Lennard’s wrasse may not be collected for the aquarium trade from Dampier Archipelago per se, but this locale is the population center for the species and also likely the environment where the species evolved. To keep Lennard’s wrasse in good health it is strongly suggested to keep aquarium temperatures on the lower end of the spectrum. Short durations of 80F degree is probably not a problem for A. lennardi but it will be difficult to keep weight on these fish at this elevated temperature due to the increased metabolism. Part of the reason the Dampier Archipelago is strongly affected by local currents is that it is not a very deep marine habitat. The shallowness of the reefs of Dampier means that it is heavily influenced by wind driven waves, tidal flow as well as oceanic currents. In the Dampier Archipelago A. lennardi is most often documented in shallow water with many sightings occurring within snorkeling depths. The fact that Lennard’s wrasse is sighted in such shallow water in proximity to lots of stony coral cover means that it is well adapted to spending time in flow. If you compare the blue and yellow wrasse to hyperactive clown tangs, Acanthurus lineatus, and how active these fish are and how much time they spend in the surge zone, it is likely that their hyperactive behavior is from occupying the same ecological niche. As hyperactive fish, both the Lennard’s wrasse and clown tangs need a lot of food, and they need it constantly. It is also interesting to note that both these shallow water fish have a pattern of blue and yellow horizontal stripes.